Our Personalised tax disc holders are a Self Cling Shield. This is one of our most popular advertsing items as it's a shield shaped tax disc holder made in a Vinyl welded shield shaped with transparent self-cling backing. It has a membership card holder at the top. When it's placed on a windscreen, your business details and company logo will be visable from inside the vehicle and out. That's got to make our Personalised tax disc holders the best idea you've had this year for advertising your business details and company logo! Other Promotional and Personalised items besides our Personalised tax disc holders click here. 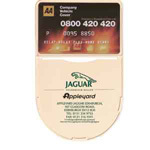 For more information, prices and samples of our Personalised tax disc holders click here.